Paul being back in Japan gave us an opportunity to meet up again, go out and for me to help him get his head around shooting portraits in nasty sunshine….. ahead of a trip he’s doing in the near future, to shoot a motorcycle team at the Bonneville Speed Trials. I hate summer in Japan. If it wasn’t just about me [uprooting the whole family for the whole summer is a bit tough], I’d leave Japan in late June and return in late September. The sun here is brutal in the summer and combined with humidity that ranges between 70 and 90%, being here can make for a miserable experience. I like sunshine. I like warm days. But 37degrees C and 80% humidity in Tokyo, or anywhere else for that matter, is a bit too much for this Englishman. …and your own. By the end of the day we were all rather sunburned. So, with Paul heading off to Bonneville sometime in the near future [no shade on the open salt flats] we thought we’d have a go at filling him up with some techniques for overcoming the conditions and getting great shots. Although I took along a stack of gear [small flashes, one big light, modifiers etc] I wanted as much as possible to have Paul use his own gear. Most of the day we paired up his two Nikon speedlights with my monopod and some basic modifiers. I use the monopod a lot, as a lighting boom when I have someone to assist me and as a manageable ‘two lights on a tall stick’ rig to hold myself when I have no help. Each of the locations was somewhere I’d shot before. On arriving in each place, Paul and I had a walkaround to see what was possible. In many cases the first shots Paul pre-visualised were ones we didn’t do. One of the skills I wanted him to pick up was the ability to walk into a location, scout it quickly, see the obvious shots and then spot the less obvious opportunities. Whether you decide to play it safe by shooting what’s obvious first or, by having what’s obvious as a backup plan if the more interesting shots don’t work out, it doesn’t matter. Seeing as much potential as possible is the key. For most of the day, Paul’s two speedlights on the monopod – at half or full power – was enough [occasionally gridded but mostly bare] to get all the shots we made. Typically we were shooting our model in shade and mimicking the angle of the sun with the flash. Or, standing our model with his back to the sun and using the flashes to bring him up to the same or more brightness than the sun. Most of the shots were made with the flashes 45degrees out from the model and at a down-angle of 45degrees. As with most of these sorts of lessons that I give, we went with a ‘product’ as the result to aim for. In this case it was a music CD: the debut album of a young, male artist who we pretended lived on the coast and whose music was inspired by the area. It allowed Paul to channel his thoughts, here primarily into shooting for the square format of CD artwork. Plus, across such a layout there needs to be continuity and narrative. “Mid-day, hot, hard sun-light – exactly what I was looking for! I’m eager to learn how to take portrait pictures in such conditions in order to prepare for a photo shoot I’ve upcoming next year. And to top the whole thing, for the best part of the day, Alfie made me use my own equipment available to me. This was more than just learning a bit about how to set the camera – it was about visualising the final image in a square format for the CD cover, how to make use of the ambient light, how to control the light with two speed lights on full power and last but not least daring to explore locations I would have walked passed in ignorance. I learnt a great deal again about how to go about on the location itself, identifying the right spots, preparing the speed lights to shoot from the right angle, bringing a bit of drama into the composition and of course getting the camera and flash settings right too. Alfie has this gift when teaching, to push you out of your comfort zone and to be motivated to take a better shot each time. His passion for what he is doing is clearly infectious. I was also amazed how well Joe participated with all the patience needed and simply followed your instructions. There’s a gallery, below, of Paul’s favourites from the shoot. All of his shots are pretty much un-edited, straight from the camera. 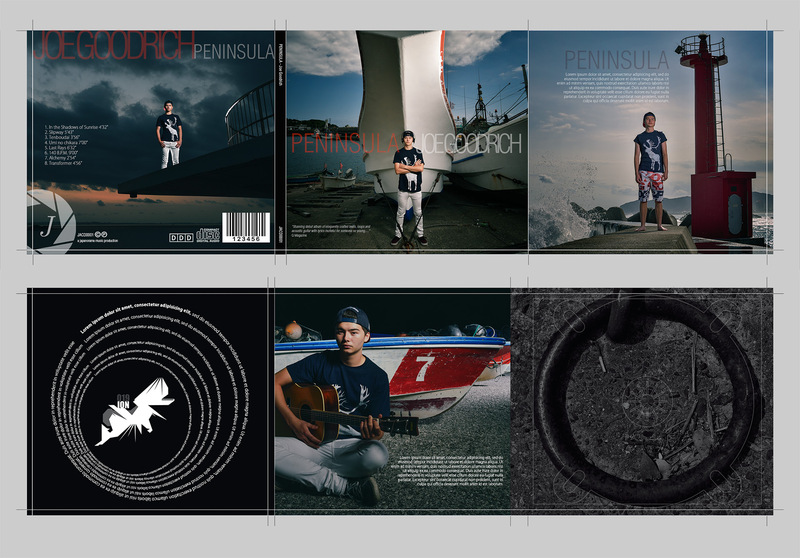 Underneath that is the music CD layout I made from several of his best shots.